Projection is a defense mechanism commonly used by abusers, including people with narcissistic or borderline personality disorder and addicts. 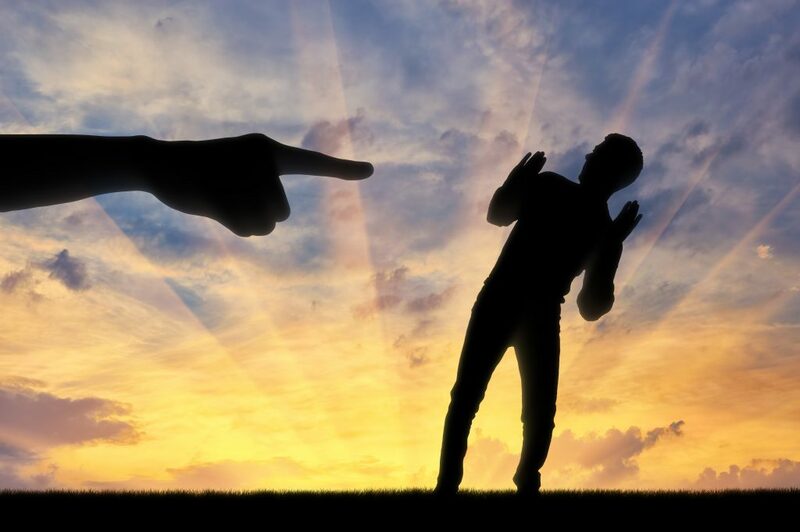 Basically, they say, “It’s not me, it’s you!” When we project, we are defending ourselves against unconscious impulses or traits, either positive or negative, that we’ve denied in ourselves. Instead we attribute them to others. Our thoughts or feelings about someone or something are too uncomfortable to acknowledge. In our mind we believe that the thought or emotion originates from that other person. We might imagine “She hates me,” when we actually hate her. We might think someone else is angry or judgmental, yet are unaware that we are. Similar to projection is externalization, when we blame others for our problems rather than taking responsibility for our part in causing them. It makes us feel like a victim. Addicts often blame their drinking or drug use on their spouse or boss. Our coping strategies reflect our emotional maturity. Projection is considered a primitive defense because it distorts or ignores reality in order for us to function and preserve our ego. It’s reactive, without forethought, and is defense children use. When used by adults, it reveals less emotional maturity and indicates impaired emotional development. Klein famously said that a mother must be able to love her child even as it bites her breast, meaning that a good mother, like a good therapist, with appropriate boundaries and self-esteem, won't react to the anger and projected badness from her baby. She will love her baby nonetheless. If instead we had a mother who reacted with anger or withdrawal, her boundaries were weak, and a child’s are naturally porous. We absorbed our mother’s reaction, as if it was a negative statement about our worth and lovability. We developed weak boundaries and shame ourselves. The mother-infant bond may have become negative. The same thing can happen with a father’s reactions, because a child needs to feel loved and accepted unconditionally by both parents. We can grow up with shame-based beliefs about ourselves and are set up to be manipulated and abused. Moreover, if one of our parents is a narcissist or abuser, his or her feelings and needs, particularly emotional needs, will come first. As a result of shame, we learn ours are unimportant. We adapt and become codependent. It’s common for codependents to have internalized or toxic shame and strong inner critic. As a result, we will find fault with others just as we do with ourselves, often about the same characteristics. We might project our critic onto others and think they’re criticizing us, when in fact it’s our own self-judgment that is being activated. We assume people will judge and not accept us, because we judge and don’t accept ourselves. The more we accept ourselves, the more comfortable we are with others. We’re not self-conscious thinking that they’re judging us. In an adult relationship with an abuser or addict, you may not believe you have any rights. Naturally, you go along or put your partner’s needs and feelings, sometimes self-sacrificing at great lengths to please and avoid conflict. Your self-esteem and independence steadily decline. As your partner behaves like a king or queen, you become increasingly dependent, even though your needs aren’t being fulfilled. This allows your partner to easily manipulate, abuse, and exploit you. Your self-doubt grows as your partner projects more shame and criticism onto you. Meanwhile, you accept the blame and try to be more understanding in the relationship. In vain attempts to win approval and stay connected, you thread on eggshells, fearful of your partner’s displeasure and criticism. You worry what he or she will think or do and become preoccupied with the relationship. You stay to prevent your greatest fear—abandonment and rejection and losing hope of finding lasting love. In time, you may believe that no one would want you or that the grass isn’t greener. Your partner might even say that in an attempt to project their shame and fear onto you. After whittling down your self-esteem, you’re prime to believe it’s true. However, when we have low self-esteem or are sensitive about a specific issue, such as our looks or intelligence, we are susceptible to believing a projection as a fact. We introject the projection. This is because internally we agree with it. It sticks like a magnet, and we believe it’s true. Then we react to the shaming and compound our relationship problems. Doing so validates the abusers’ ideas about us and gives them authority and control. We’re sending the message that they have power over our self-esteem and the right to approve of us. A projector can exert enormous pressure on you to accept the projection. If you’re empathic, you’re more open, less psychologically defended. If you also have poor boundaries, as described above, you may absorb a projection more easily and identify with them as your own trait. Understanding how projective identification works is crucial for self-protection. Recognizing the defense can be a valuable tool, for it’s a window into the unconscious mind of an abuser. We can actually experience what he or she is feeling and thinking. Armed with this knowledge, if someone shames us, we realize that he or she is projecting and reacting to his or he own shame. It can give us empathy, which is helpful, provided we have good self-esteem and empathy for ourselves! Building self-esteem by disarming our inner critic is our first defense against projection. It’s important not to argue or defend yourself, because that gives credence to the projector’s false reality. If the abuser persists, you can say, “We simply disagree,” and leave the conversation. The projector will have to stew in his or he own negative feelings. See “Do’s and Don’ts in Confronting Abuse.” Learn how to communicate with a narcissist in Dealing with a Narcissist and how to overcome toxic shame in Conquering Shame and Codependency.